There is nothing more frustrating for a home gardeners than to see the fruits of their labors lost to diseases and pests. Diseases occur when environmental conditions are suitable for pathogens to develop on susceptible hosts. Though the past few months have been very pleasant, the warm days and cool night have contributed greatly to the development and spread of many diseases that can attack vegetable in the home garden. Some pathogens attack a wide variety of plants, whereas others attack only specific plants. Additionally, some pathogens can attack all plant parts, whereas others attack only selected tissues. 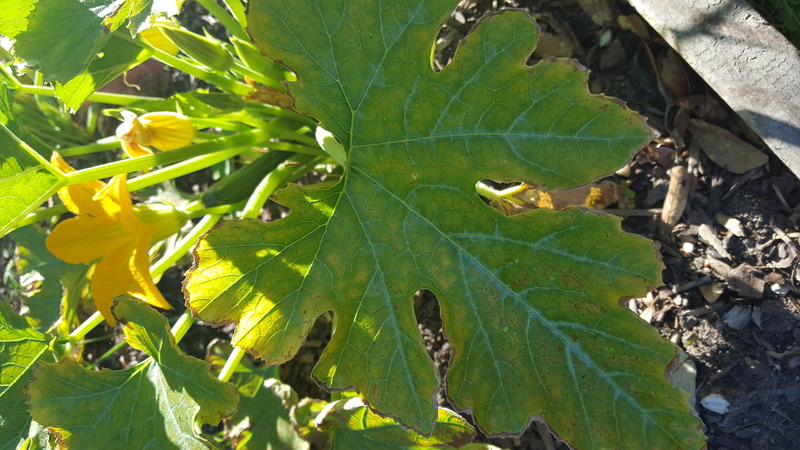 If you have vegetables growing in the garden that are part of the cucurbitacea family such as cucumbers, squash, zucchini and melons, then you might have noticed some discoloration or fuzzy white areas starting to form on the leaf. This is likely mildew. Two types of mildews affect vegetables – downy and powdery. Powdery mildews predominate during dry and warm-to-hot temperatures, whereas downy mildews thrive during cool and wet periods. Powdery mildew will develop white powdery spots on both leaf surfaces and expand as the infection grows. The leaves will eventually turn yellow or brown and fall off, exposing the plant or fruit to sunburn. In some cases, powdery mildew will cause the leaves or shoots to become twisted or distorted. On the other hand, Downy mildew causes light green to yellow angular spots on the top surface of the foliage. A white fluffy growth will begin to appear on the lower sides of these angular spots. Over time, these lesions turn brown and dry up. Downy mildew progresses from the older leaves, moving up the plant to the younger leaves. Severely infected leaves may die. On rare occasions the pathogen can become systemic, causing dark discoloration of stem tissue. Both types can be managed successfully by planting resistant varieties in areas of the garden with full sun and good air movement. Plants can be protected with synthetic chemicals or biopesticides. As with most diseases and insects, prevention is the best method on control. 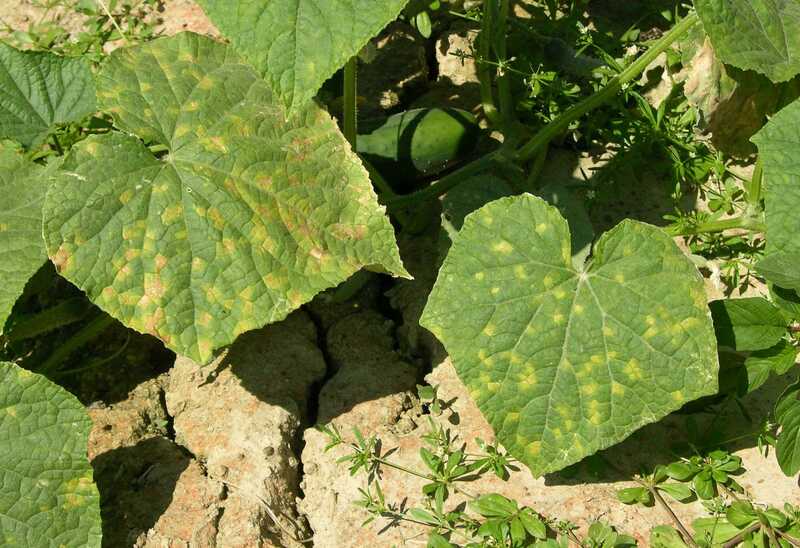 Many practices can help to prevent these diseases from the beginning, such as planting in full sun. This will help to dry off the leaf surfaces quickly as to not spread the disease through water droplets sitting on the foliage.Be sure to keep the garden well mulched as well as provide proper spacing between plants to allow sunlight and air flow through the crop to help dry the foliage. Be sure to avoid watering in the evening. Setting an irrigation time for early in the morning or setting out the hose and the sprinkler the evening before soyou only have to turn the spigot on in the morning are great ways to get water to the garden early in the morning. If you are unable to determine whether you have downy mildew or powdery mildew, consider submitting a sample of the foliage to the LSU AgCenter Plant diagnostic center. Information on how to submit and sample, the forms needed, and diagnostic fees are located on the LSU AgCenter website www.lsuagcenter.com.